Remember those funny Halloween costumes we’ve been laughing about for days? Well, we’ve discovered something even better: pretty much any costume on a cat. Halloween isn’t only about creepy or clever costumes, face-transforming makeup and all that fake gore. It’s also about some of the warm and fuzzy parts of life too — like forcing your feline friend into a mini-outfit. So in the name of October 31 shenanigans, get a few laughs in while enjoying these cats in get-ups. And then really think through whether or not your kitty will turn your house into a crime scene if you make her part of the group Halloween costume this year. 1. Octo-Cat: Give your meow six more legs and a sparkly underwater costume for max cuteness. 2. Franken-Cat: We love this feline twist on the classic horror film! Have more kit kats? Dress them up as Bride of Franken-Cat and Dracula and you’ve got the whole crew! 3. Sailor Kitty: Outfit your furry friend in a seafaring sailor suit. 4. Teddy Bear Cat: Can your little furry friend get any furrier and more squeezable? Apparently so! 6. Sphinx Cat: Your BB will walk like an Egyptian when you make her into a gorgeous kitty kween. 12. Your Fright Shop Cat Police Costume ($19): Don’t mess with this guy. We’re pretty sure that’s a miniature cat-taser (AKA claws) in his paw. 15. Unicorn Cat: Yass. We’re hoping to see many more unicorn kitties this Halloween. The doll-rider is optional (depending on how tolerant your kitty is). 16. Hamburger Cat: We’ll take one with everything including the whiskers! 17. Harley Cat: Harley Quinn costumes aren’t just for people anymore. Your fur-covered friend can be a tricky villain too, now! 24. Pawsome Couture Amazing Minions Cat Costume ($50): These are the most adorable minions we’ve ever seen. The costumes work best with more than one. We’re completely obsessed. 31. Suddenly Cat Pirate Costume ($25): This pirate costume is amazing. Plus, film your cat running and turn it into a GIF; it might just go viral. Oh wait, that’s been done. 33. Cat-Cow: Calling all yogis! Get punny with your cat and dress him up as one of the classic cat-cow postures. 34. Tiger Cub: This little Bengal already looks the part! We are so in love with the adorable mane-d look. 35. Harry Paw-ter: Woohoo! Finally, a costume for Potterheads that truly does the series justice. Getting your pet in on the action is the best idea yet. 36. Woody from Toy Story: Any Pixar lover’s cat costume dream. The fact that this cat is busting out of its Woody costume makes it even funnier. 37. Mario: Any cat can dress up as Mario or Luigi, but not just any cat will have the perfect mustache marking to match. 38. Batman and Joker: The Joker has totally mastered the evil-crazy look. We’re not confident that Batman’s gonna win this round, but the pictures you’ll take will be priceless. 39. Devil Cat: How could something so cute be evil? Oh, it’s possible. All it takes is dressing your cat in a costume to find out. 40. “Hot Dog” Cat: Or a “Hot Cat.” There’s nothing like a play on words to get the Halloween puns flowing. 41. Santa Cat: This costume had us at the Santa Hat — and then we saw the beard. Maybe you’ll get to use this costume during both holidays. 42. Eeyore Cat: How much do you love the adorable downer from the Winnie the Pooh books? We’re guessing a lot. And this cat makes for an adorable Eeyore. 43. Monsters: “I am adorable. Hear me roar!” What do you think he’s really saying? 44. Princess Leia: Your cat was as excited as you for Leia’s return, right? Meow the force be with you! 45. The Life Aquatic Costume: Wes Anderson fan? Us too. This Steve Zissou costume makes for one cool cat. Seriously. 46. Batman Cat: Here’s one cat costume that lets Gotham (and the rest of us) sleep at night. 47. Dragon: This ferocious feline can’t help it if he looks like the cutest dragon ever. So adorable. 48. 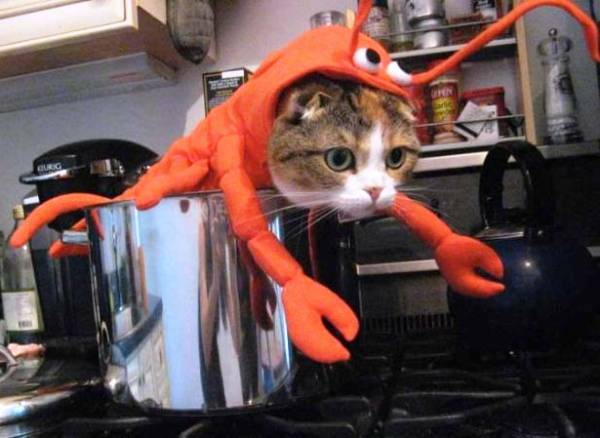 Crab: For the extra crabby kitty in your life. Bonus points for his adorable tiny shirt. 49. Dinosaur: Here’s a take on Catzilla that’ll win you some favor this Halloween. We’re willing to bet this dino-cat makes for one awesome snuggle buddy. 50. Donald Trump: Make America great again — with this cat costume. Honestly, though, this is a really good start! Do you have your own feline friend who looks fabulous in a Halloween Costume? Show us on Pinterest!